World elevation data displayed in AEJEE. 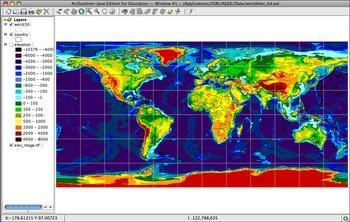 Module 2 takes an map-based approach to studying Earth. In Weeks 5 through 8 of the course, you will learn to use tools and techniques for incorporating geographic information systems (GIS) data into your classroom teaching. Invasive species are characterized by their ability to spread rapidly, the lack of natural controls or predators, and the ability to persist. They are a global problem that includes all types of biological invaders, not just plants. During Week 5, you will become familiar with basic GIS functions, learn to build and execute GIS database queries, and apply GIS techniques to investigate the spread of invasive species. The path that a river takes over land changes through time. During Week 6, you will learn to symbolize and classify GIS data as you explore how the flow of the Mississippi River has changed through time, how evidence of ancient rivers can be found in modern soils, and how rivers transport and deposit sediments to balance the erosion and subsidence of their deltas. Importing latitude/longitude data in tabular format into a GIS enables you to view the data spatially and begin to think about geographic patterns. During Week 7, you will import, symbolize, and spatially query earthquake data to investigate patterns with current and historical earthquake activity. Forest fires can be both detrimental and beneficial to the environment. NASA satellites and GIS play an important role in monitoring and managing forest fires. During Week 8, you will use GIS analysis techniques to investigate the fires that took place in Yellowstone Park in 1988.